It seems that given enough of a shine, any bad idea can gain traction. For most of history, scholars have debated the events of the life of Jesus recorded in the biblical accounts. However, the vast majority of New Testament scholars, both those who are of the faith and those who are critical of it, have held that it as historical fact that a man named Jesus of Nazareth lived in first century Palestine, had disciples follow him, and was eventually put to death. 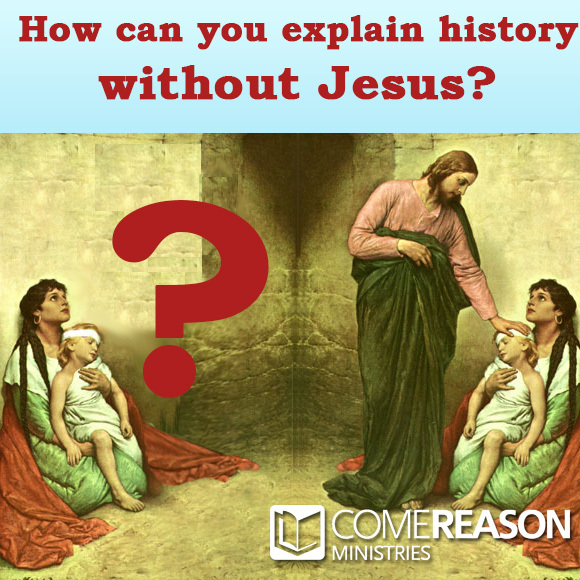 While a few fringe elements doubted the idea of a historical Jesus, not even most atheist New Testament scholars believe that Jesus never existed. But with the advent of the internet and the ability to self-publish, that fringe has grown a much larger following. 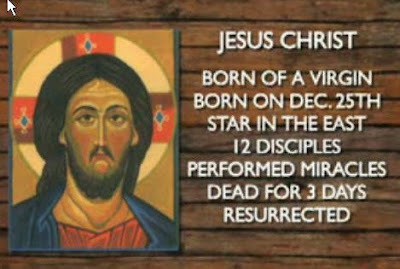 Now there are very popular atheists who hold that the entire account of Jesus's life, teaching, and death, are simply made up, setting a fictional stage for a fictional tale of a mythical messiah. They claim that if Jesus was such a big deal he would surely have been noticed and written about by more than just the biblical authors. Van Voorst concludes that ultimately to do good history, we must do what scholars have done for centuries. We have to take the New Testament accounts themselves as what they are, documents of ancient history. The evidence there is very strong that the New Testament authors were writing in a specific genre of ancient biography, meaning they were writing about a real person. 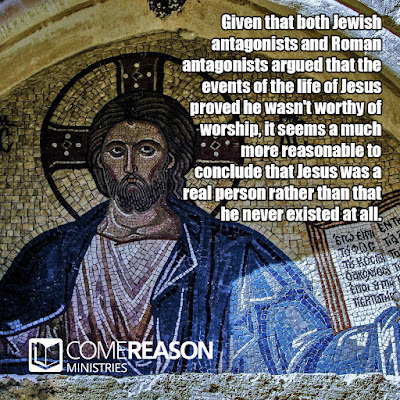 And given that both Jewish antagonists and Roman antagonists argued that the events of the life of Jesus proved he wasn't worthy of worship, it seems a much more reasonable to conclude that Jesus was a real person rather than that he never existed at all. 1. 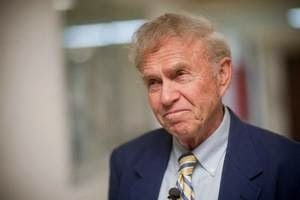 Robert E. Van Voorst. Jesus Outside the New Testament: an Introduction to the Ancient Evidence. W.B. Eerdmans Pub., 2000. 68. How do you identify a person? If you send your spouse to pick up your old friend at the airport, whom they've never met, you will describe that person to them. You may say, "My friend's name is Dan. He's 5'9", dark hair, mustache, and will be wearing a black coat carrying a green suitcase. These attributes help identify Dan. Certainly, they aren't exhaustive, but by providing a description to your spouse, you are helping your spouse eliminate a great number of other individuals coming out of the airport. The right person to place in your car must have at least these attributes. 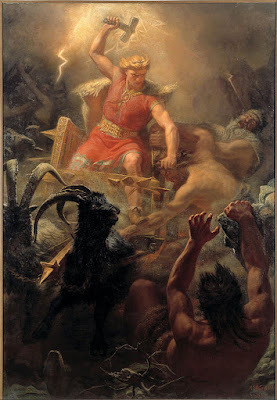 When our atheist invokes the name Thor instead of God, what does he mean? Is he pointing to the same being under a different name? No, because the Thor and Yahweh, the God of the Bible, have different attributes. For one thing, Thor is not eternal. He is the son of Odin and Jord, other Norse gods.1 Norse gods can and do die and Thor is capable of dying. Thor also must experience the passage of time. As Tolkien states, "In Norse, at any rate, the gods are within Time, doomed with their allies to death. Their battle is with the monsters and the outer darkness. They gather heroes for the last defence. "2 Notably, Thor isn't all powerful. In "The Lay of Thrym" from the Poetic Edda, Thor loses his hammer to the lord of the giants who has hidden it from him and Thor is forced to pretend to be a bride in order to retrieve it.3 In the poem, Thor is presented as an exaggerated human, who eats and drinks, but is a material entity. The God of the Bible holds none of those limitations. He is eternal and everlasting, sitting outside of time. He is all powerful. He cannot be killed and he cannot be forced to do something or have a foe who overpowers him. Yahweh is definitely not Thor. While it's clear that Yahweh and Thor are different beings, it is also because of Thor's limitations that we can falsify the claim that Thor is responsible for creating the universe. When we seek to answer the question of the universe's beginning, we are trying to explain the origin of all material existence, of space itself, and of time. Why there is space-time and matter are what needs explaining. However, Thor cannot be the explanation for all matter space and time since Thor himself is material, is subject to time, and has a beginning. He sits within a spacial dimension, as the loss of his hammer (hidden "eight leagues deep in the earth") indicates. Therefore, Thor cannot be the explanation of the universe for Thor, if he exists, is part of the universe that needs explaining! The atheist's claim is clearly falsifiable using the basic rules of logic. Any attempt to change Thor's attributes b the atheist would mean that we are no longer talking about Thor, just as any attempt by my spouse to look for a clean-shaven man who is 5'11" would mean she's no longer searching for my friend. It is reasonable to ask the questions "Why is there something rather than nothing?" It is reasonable to ask "How did all this get here?" It is not reasonable to think invoking Thor is an equally viable explanation to the Christian God. To answer such questions with "Thor" is clearly to not answer them at all and those who wish to be taken seriously should think a little harder before doing so. 1. "Thor." Encyclopedia Mythica. 2017. Encyclopedia Mythica Online. 08 Feb. 2017 http://www.pantheon.org/articles/t/thor.html. 2. Tolkien, J. R. R. Beowulf: The Monsters and the Critics. Folcroft, PA: Folcroft Library Editions, 1936. Print. 26. 3. "The Lay of Thrym." translated by D. L. Ashliman. Professor D. L. Ashliman. University of Pittsburgh, 2009. Web. 08 Feb. 2017. http://www.pitt.edu/~dash/thrym.html. There are plenty of people who deny the existence of God or the resurrection of Jesus. They may hold that there was a sage teacher of morality named Jesus who lived in the first century who was eventually executed by the Romans. Usually, the story goes that his followers taught others about his exploits, embellishing them with legendary acts and miraculous flourishes until we have the accounts of his life we read in the Bible today. These claims have been with us for centuries. Who can ponder on Paul's history without feeling that it must be regarded as part of the evidence for the truth of Christianity? Paul's existence and course of life, and the writing of his letters to the Christian Churches are held to be facts by all the German and French schools of skepticism; and that "Reverend" Robert Taylor that I mentioned to you who some fifty years ago was a favourite of the London freethinkers holds by the same facts But what a puzzling contradiction it seems for men to acknowledge the reality of the life and recorded acts of Paul as facts and yet to deny the truth of Christianity. This problem of explaining events such as the conversion of Paul and his self-identification as one who martyred Christians immediately after the crucifixion of Jesus, the quick dissemination of Christianity by Jesus's original followers throughout the Roman Empire, along with the appeal over and over again to eyewitnesses becomes hopelessly strained and convoluted if Jesus wasn't a real, living person. All attempts to reconcile a real Paul with a mythical Jesus hold less explanatory scope, less explanatory power, and rely on ad-hoc assumptions when attempting to make any sense at all. Cooper saw this when writing in 1871! If Paul was real, then his life and his conversion need to be explained. The most cogent way to do that is by believing what he himself testified: he had seen the Risen Christ (1 Cor. 15:8). I want to offer a special thanks to Dr. Timothy McGrew for collecting Thomas Cooper's book and others at his site HistoricalApologetics.org. All the titles are in the public domain and free to everyone. 1. Ehrman, Bart D. "Did Jesus Exist?" The Huffington Post. TheHuffingtonPost.com, 20 Mar. 2012. Web. 29 July 2015. http://www.huffingtonpost.com/bart-d-ehrman/did-jesus-exist_b_1349544.html. 2. Cooper, Thomas. The Bridge of History over the Gulf of Time a Popular View of the Historical Evidence for the Truth of Christianity. London: Hodder and Stoughton, 1874. Print. 154-155. 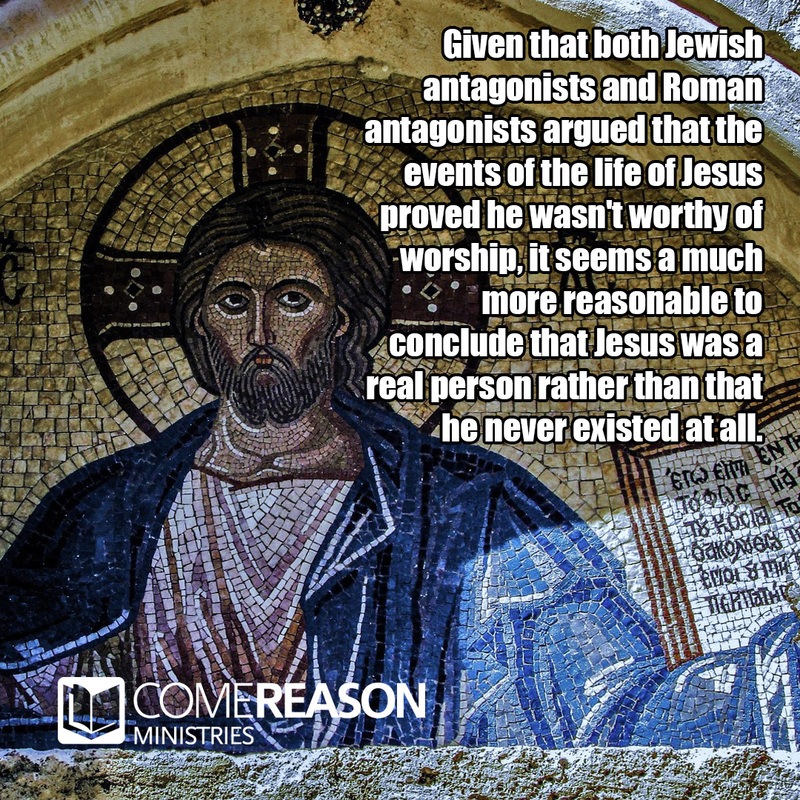 Yet, the Jesus-Myth proponents continue to make the charge that Jesus didn't exist or that perhaps someone named Jesus existed, but the Gospel accounts were created out of the whole cloth of dying-and-rising god myths popular in the ancient world. Certainly the Internet has spread their charges beyond what one would reasonably expect. It's much like the villagers in the story of the Emperor's New Clothes; they want to believe these links so badly, that they fail to see the reality that nothing is there. In that vein, I'd like to offer six different ways the fashion statement of mythicism fails. This is one of the biggest errors of the Zeitgeist movie and charges like it. It basically takes all the different mystery sects from 1500B.C. to 500 A.D. and blends them together them together, claiming they all had a consistent belief of gods dying and rising again. They argue that this is some kind of an established, coherent overarching set of beliefs from which Christianity borrowed. However, if anyone bothers to actually read the details of the different faiths mentioned, one will find vast differences in their foundational understanding of life, death, and existence beyond death. Even with in faiths like Mithraism, it had evolved greatly over that 2000 year time span.2 To say that Christianity stole this belief or that one from a religion like Mithraism when those beliefs weren't necessarily even regarded as part of that system any longer (or had yet to be developed) is ridiculous. Basically, this error occurs when a critic distorts the teaching of the mystery religion by using Christian language to describe a belief - and then claiming that Christianity stole from it because the beliefs read similarly. The concept of baptism in Egyptian mythology centers around the Nile's supposed physical power to heal while baptism in Christianity focuses on the sin nature of the individual. This happens over and over, where the mystery practice is usually something completely different in intent or symbolism than what Christian understand it to mean, but it is made to sound similar for impact value. Many critics will find something kind of like a resurrection story and then try to demonstrate how Christianity borrowed from this type of belief. Usually, this is at the expense of many crucial details that really differentiate the myth from the historic Christian account. For example, Zeitgeist claims that Horus was “crucified, buried for 3 days, and thus, resurrected.” In the actual myth, Horus is a young child who is revived from a scorpion sting by another god that wielded the magic to do so. It's nothing like Jesus' claim to have the power to take his own life up again. Also, many of these stories aggrandize the myth more than is necessary. Horus was born on December 25th? Were they using the Julian calendar system in ancient Egypt? The Gospels themselves don't tell us when Jesus was born. December 25 cam later, and was probably based on a completely different paradigm. Horus' birth was visited by Three Wise men? Where does the Bible say three? There are three gifts mentioned, but no number of wise men is cited. Plus they came up to two years after Jesus' birth. 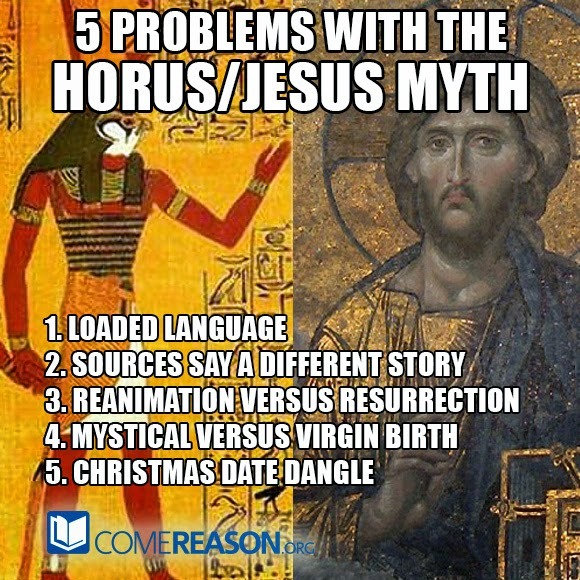 The mythicists misrepresent the Biblical accounts and then try to make the other myths similar. Lastly, one should always ask for support for the claims made by the mythicists of the features of their myths. Who says that these things are true? How do you know Horus was baptized or raised after three days? Have you read the actual myth? What verification do you have that you understood the cult's beliefs accurately? This is one of the most crucial questions to ask, since reading the myths themselves will usually be enough to show that any supposed parallels to the life of Jesus are either minor or non-existent. 2. Esposito, Lenny. 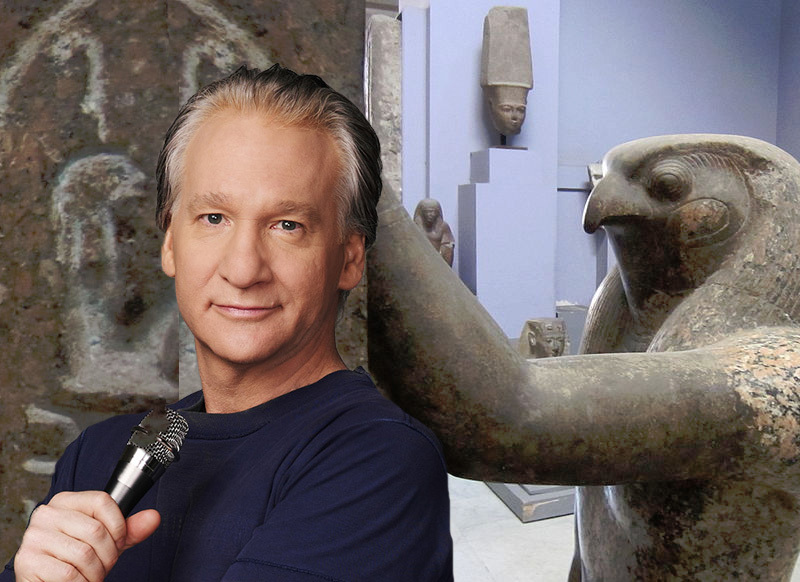 "Did Christianity Steal From Mithraism?" ComeReason.org. Come Reason Ministries, 01 Nov. 2001. Web. 29 July 2015. http://www.comereason.org/mithraism.asp. 3. Nash, Ronald H. The Gospel and the Greeks: Did the New Testament Borrow from Pagan Thought? Phillipsburg, NJ: P & R Pub., 2003. Print.